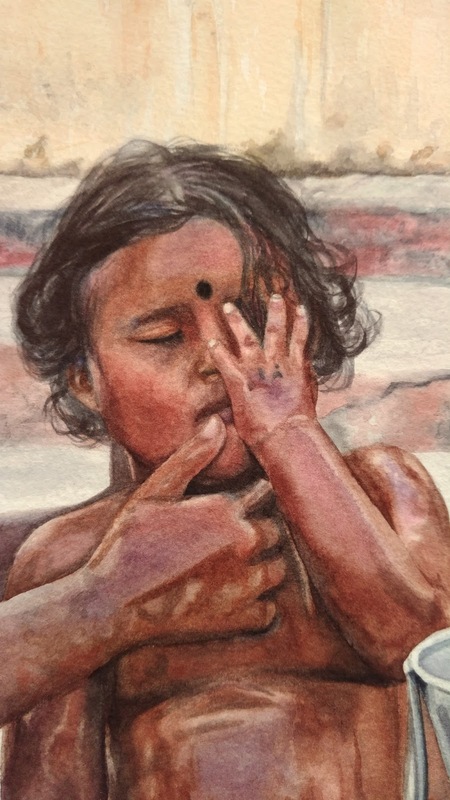 What I love about this painting is the sweetness of mother and child, but also simplicity of needs. There is no bath tub, no shower, no fresh white towels, no rubber ducky, no brand-name baby shampoo, no sink, no bathroom even! There is only the open air, water in a basin, and concrete beneath the child and mother. Grass sprigs are growing out of the cracks, and there is some sort of graffiti in the background. But still this little one comes forth clean reguardless, and the primitive surroundings matter not when it comes to his bath. A closeup of the baby’s face! I love the smile on the mother’s face, as her child wipes the water from his eyes. I also love that she is in a Sari, because wearing a dress while bathing a child is not just gorgeously accomplished, but also it’s real life! I hope I was able to capture the wetness on baby’s body, and the puddle at their feet, because I think this was the first time I ever painted water in a watercolor (the irony!!) If you look closely, you might also see some of the colors of Ember’s own Sari reflected in the metal basin in front of the baby. Still-lifes are not my favorite thing to paint, but I did enjoy painting that little basin! This was the first time I was able to complete a painting in the summer. With three children, it’s difficult to get anything done in the summer time! The only way I was able to complete this one was because a friend of mine, Karin, offered to watch my children on Fridays so I could paint. Thank you so much, Karin, for giving me the opportunity to bring this painting to life! For every print I sell, I will donate 10% of all profits to Rising Star Outreach in India.